In the years since the acclaimed recordings made by the Hungarian pianist Zoltán Kocsis back in the 1980s and 90s, no single pianist has attempted to record a complete edition of Bartók’s works for solo piano! For a quarter of a century, no new comprehensive perspective on this multifaceted oeuvre has been cast, an important and varied, yet internally cohesive body of work that displays so many different aspects of Bartók’s creativity. This is exactly what the German pianist Andreas Bach has set out to achieve - "... to find the young Bartók in the late works as well as the late Bartók in the early works. And (...) create a recording that presents a Bartók different from those usually encountered and which are by contrast, ‘middle-of-the-road’", emphasizing “not only the rhythmic and folkloric content, but also providing an opportunity to discover Bartók‘s harmonic thinking”, an aspect of the composer’s language that few fans had the opportunity to appreciate before. 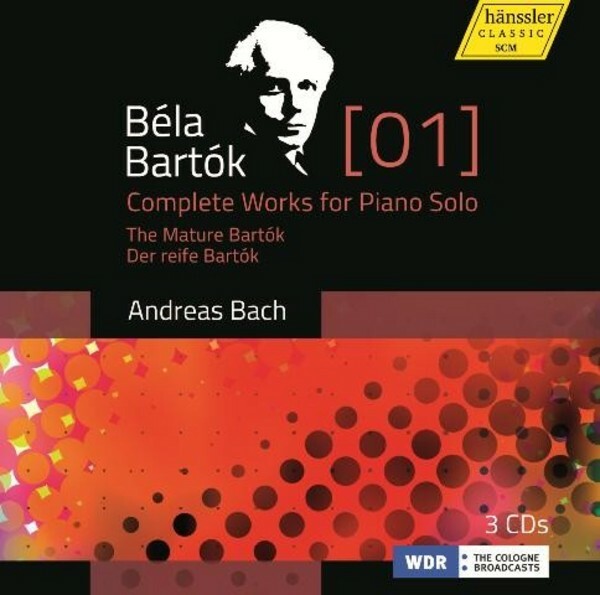 Volume 1 of this new complete edition presents individual works that Bartók composed in his mature, personal style, including the Sonata, the Sonatina, the Suite op.14, and the 14 Bagatelles. Folk music influences are present but only as distant references.